Drivers overwhelm an Arizona hotline that updates road conditions. BELLEMONT, Ariz. – A winter storm pummeled the western United States on Thursday with fierce wind gusts, heavy rain and more than 2 feet of snow, closing hundreds of miles of roads and dumping a snowy mix of precipitation on the edges of Phoenix. Officials closed a road into Yosemite National Park in California after a rock the size of a dump truck tumbled onto the road, and strong winds created snow dunes on rooftops, front yards and streets across mountainous areas of Arizona. Snow and ice forced an hours-long closure of the two major thoroughfares in northern Arizona, stranding motorists south of Flagstaff and the Grand Canyon. 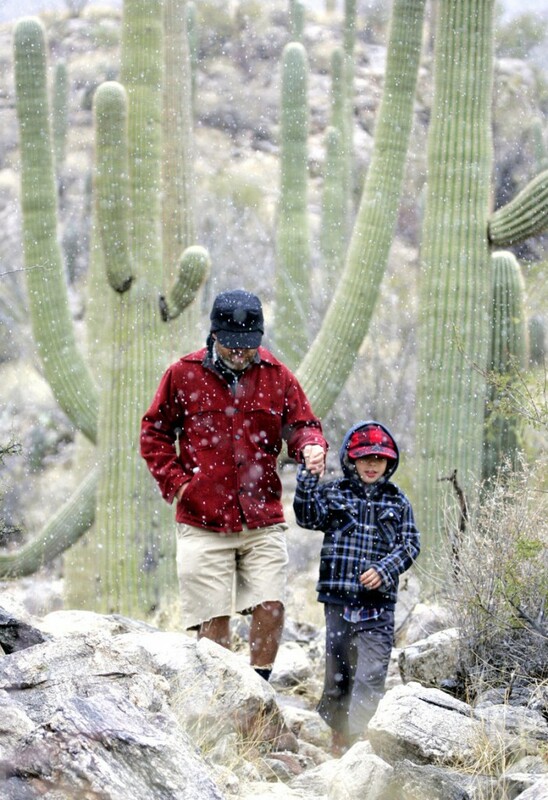 Phoenix saw snow-type flurries that the National Weather Service said were a combination of hail and snow that melts before it hits the ground. Drivers wanting to know how to get around the storms overwhelmed an Arizona hotline that provides automated updates on road conditions. The Silverton Mountain resort in Colorado reported 22 inches of snow, but only about 120 people were on the mountain because officials closed highways leading to the ski area for avalanche control and because of adverse conditions, resort co-founder Jen Brill said.